Anacondas are formidable predators, king of the food chain in their native South American ecosystems. While contact with mankind and domestic animals is rare, these large, heavy-bodied constrictors pose a potential threat to anything that crosses their path. Other dangers are also associated with these large snakes. While there are four species of anacondas in the genus Eunectes, the one most studied is the green anaconda (Eunectes murinus), sometimes called the common or giant anaconda. These snakes are the largest in the world based on weight, although they're not the longest. Adult females can reach lengths of up to 30 feet, although around 20 feet is more common. Males are much smaller than their female counterparts. Other anaconda species include the smaller yellow anaconda (Eunectes notaeus), which grows on average 12 to 15 feet, Beni anaconda (Eunectes beniensis), which is strikingly similar to the green anaconda, and Deschauense's anaconda (Eunectes deschauenseei), which is the smallest anaconda. Anacondas, like other constrictors, subdue their prey by coiling around their bodies. The prey's death results from suffocation, loss of circulation or a broken spine or neck. The snakes have jaws lined with many short, sharp teeth that are angled toward the throat to hook prey and keep it from escaping. Anacondas are the top predators of their native land, although immature anacondas and some adults may become prey of other predators. Green anacondas' diet includes adult deer, capybaras and caimans, all large animals in their own right. Jaguars have also been on the menu for adult anacondas. In short, no creature that inhabits the same region and habitat of the green anaconda is safe from attack. 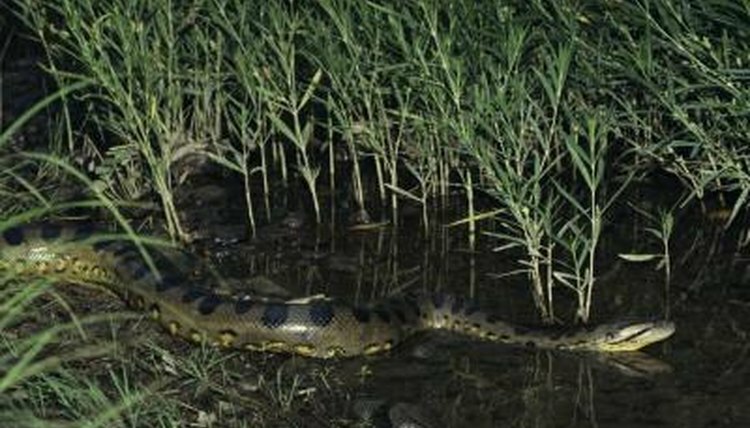 Other anaconda species prey on birds, rodents, medium-size mammals and other creatures, and could potentially pose threats to domesticated animals when given the opportunity. While these large snakes live in areas that aren't frequented by man or livestock, many species of livestock indeed could be potential meals for adult anacondas of any species. Although rare, the Beni anaconda has been known to feed on dogs, cats and chickens. Attacks on man by anacondas are few and far between, outside Hollywood, but not completely unheard of. Biologist Jesus Rivas has been studying the green anaconda and other large reptiles native to the Venezuelan llanos. His report "Predatory Attacks of Green Anacondas (Eunectes murinus) on Adult Human Beings" in "Herpetological Natural History" documents two predatory attacks on humans, his assistants in the field. His report states that anacondas are not man-eaters by nature but are generalists who will go after any prey they can subdue and swallow. Many humans are well within the prey-to-predator ratio. The native habitats of anacondas and people don't readily overlap, making human attacks a low possibility. His report ends stating there is potential for anacondas to prey on people. Although anacondas are vital to their native ecosystems, their presence in other areas is causing problems. The Florida Everglades have become overrun with invasive snakes, including boa, python and two anaconda species: the yellow and green anacondas. The yellow anaconda is listed as a high-risk species by the IUCN, while the green anaconda is listed as medium-risk. The snakes put native mammals, birds and reptiles at risk through predation. U.S. Geological Survey: Report Documents the Risks of Giant Invasive Snakes in the U.S.